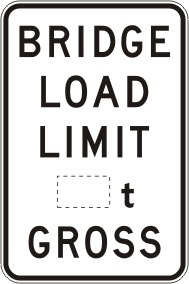 A bridge load limit is a restriction placed on the mass vehicles allowed to cross a given bridge. Bridge load limits are typically determined by a specialist structural engineer. Regulatory signs are place at both approaches to a bridge with a load limit, and it is a police responsibility to ensure the signs are complied with. Guide signs advising heavier vehicles to make a detour are usually necessary. 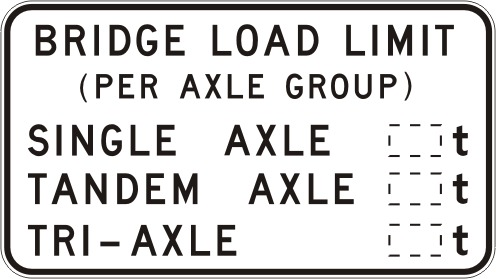 The signage below is used to inform drivers of bridge load limits.